The MACH1000 devices are designed for the special requirements of industrial automation. They meet the relevant industry standards, offer high port density (up to 28 ports), and provide very high operational reliability, even under extreme conditions, and also long-term reliability and flexibility. You set up your own switch according to your requirements regarding the number of ports, transmission speed, media type, connector type, temperature range, voltage range and software variant. 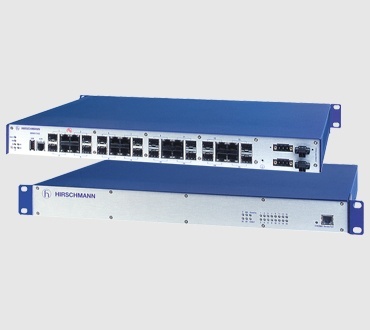 The MACH1000 is also available in an all-Gigabit version (MACH1040), offering 16x 10/100/1000 Mbps RJ45/SFP combo ports to provide countless copper/fiber combinations (including optional 4x PoE ports IEEE 802.3af). All ports support version 2 of the Precision Time Protocol in accordance with IEEE 1588 V2. Layer 3 functionality is available with the R software option for this all-Gigabit switch. Explore the impact wireless is having on train-to-ground systems, including Communications Based Train Control (CBTC), Passenger Information System (PIS) and Surveillance Video (CCTV). Belden and Hirschmann are Supporting German Energy Suppliers With the Construction of an Underground Transformer Substation.